Product information "HOPE 19 mm heavy duty 6 mm tip holder"
An excellent and strong tool for stock removal. Suited for hollow forms with a 30mm opening or larger. Tip holder is a tear shape and is adjustable. 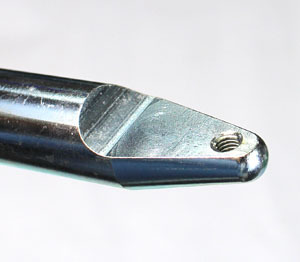 Tip is a 6mm carbide cutter. This blade is double ended with the 6mm carbide on one end and the other end machined to take the 23mm HSS scraper cutter. It will also take Robert Sorby tear drop scrapers. The 23mm HOPE scraper is an optional extra. If you buy the full kit, the scraper from the swan neck will fit this blade. Related links to "HOPE 19 mm heavy duty 6 mm tip holder"
Customer evaluation for "HOPE 19 mm heavy duty 6 mm tip holder"